What an adventure! What an experience! What a team! Wow…was I ever out of my comfort zone! 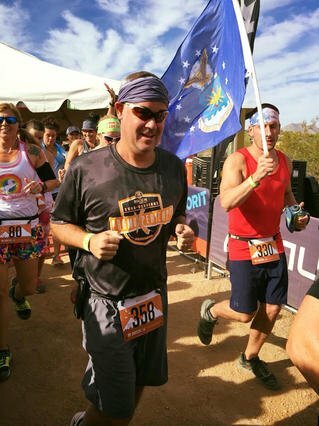 On November 2-4, I was honored to be a part of a group of 8 promotional products professionals that gathered together to take on the Ragnar Relay Trail run. Dana Zezzo from Imagen Brands headed up this amazing effort that put the idea of a true “Field Test” for Promo Premiums to the test. Watch the video here. The team consisted of Dana Zezzo and Ryan Meulemans from Imagen Brands (Crown and Vitronic), Joe Durham from Halo Branded Solutions, William Adair and Les Edwards from Proforma, Jimmy Visney RLK & Associates, David Schultz from Distributor Central and yours truly. 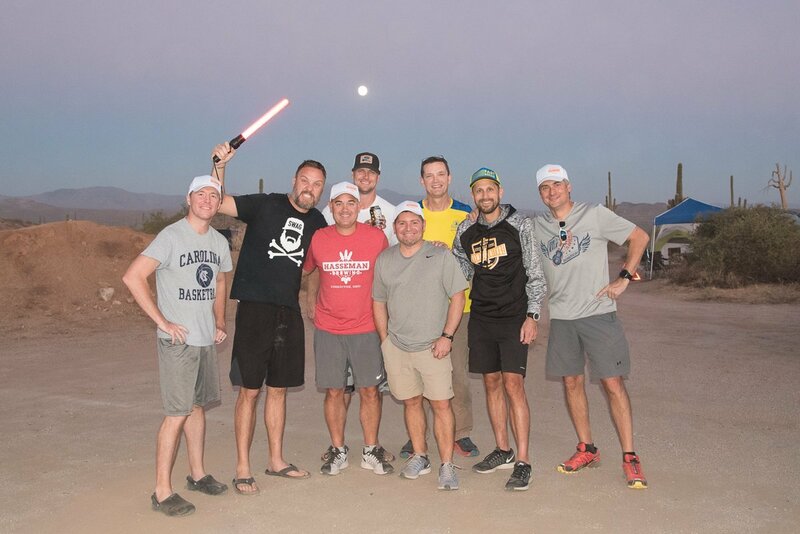 In order to complete the Ragnar Relay challenge, each member of the group needed to run 3 different challenging loops, of 4.1, 4.7 and 6.7 miles respectively. The terrain was rocky, steep and challenging. And once the group started running (I kicked us off at 10am on November 3), someone on the team was running non-stop until we finished them all! I was so impressed with the team. From the very beginning of setting up camp, everyone pitched in. As we pulled into the drop off area, we had to drop our gear and then go “claim a camp spot.” Once claimed, we had to set up camp and get ready to rest, sleep and live in this 20 x 20 spot. Lots needed to be done in a short period of time and it was amazing how everyone worked together. And let’s face it…I was no help. At one point I looked at Dana and said, “I have never set up a tent before.” You could tell by the look on his face, he was wondering why he invited me. And speaking of gear, Dana and Ryan really hooked the group up! Not only were we prepared with tech shirts, sweatshirts and flannels from S & S Activewear, but the Imagen Brands group came through with water bottles, Viking tumblers and all the Coleman camping gear we needed. It was amazing (and I will outline those in a future blog post). After my initial run at 10am, I had some time to rest as my teammates picked up the torch (or actually the belt). The next time I was called onto run was around 5pm. At that time I did the challenging Red loop, which was a 6.7 mile run with a big climb near the beginning. The views were amazing at the top of the mountains. My only complaint is that I could not take too much time to take them in! I was too afraid I would fall. My final run came just after midnight. I took nearly an hour to complete this 4.7 mile run. Then I had time to rest a bit as I waited for my team to complete their legs. After the run was completed, we got our finisher medals and tore down camp as quickly as we could. Again, I was so impressed with the teamwork. 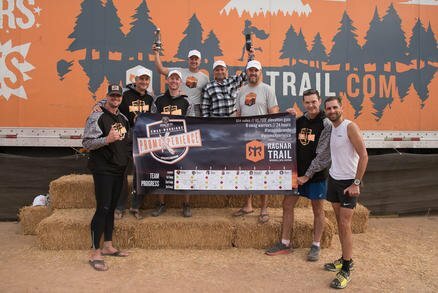 Not bad for a team of guys that (for the most part) had never really met before this trail run. After the race we all headed to a hotel where we took a (long overdue) shower and soaked our tired bodies in a pool and hot tub. While we all enjoyed a cold beer and shared stories, we recovered as best we could. I can say that through this “PromoXperience” I not only gained some valuable memories, but I connected with members of the industry in an event like no other. A huge thank you to Dana Zezzo, Ryan Meullmans and the entire Imagen Brands team for making it happen! Thanks for reading this! If you want to keep up with all of the adventures of Hasseman Marketing (and join our VIP list) please feel free to sign up here. 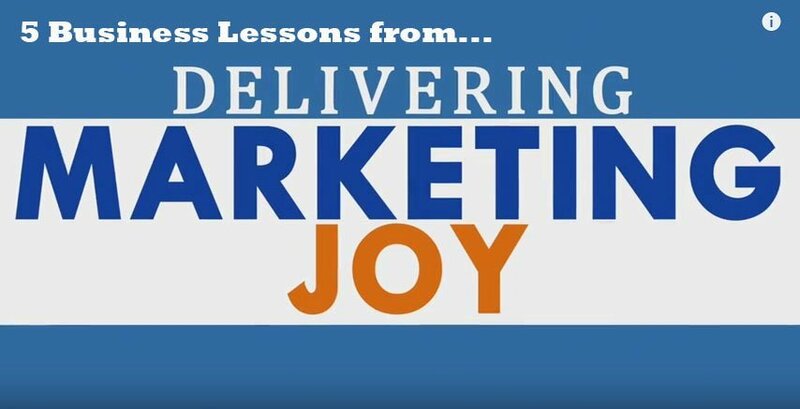 5 Business Lessons from Delivering #MarketingJoy! Each week on Delivering Marketing Joy, I get the chance to interview fantastic leaders, entrepreneurs, authors and thought leaders on the best way to grow and run an organization. What started as an interesting way for me to be able to create great content, has become a weekly class for me to attend. I have learned so much from listening to these leaders. While your best bet to get the most from this #MarketingJoy class is to subscribe to the channel here or to sign up for our VIP list, let me give you some of the most recent lessons I have taken away from Delivering Marketing Joy! Customer Service Drives Sales: In one of the most recent episodes, I had the chance to chat with Ray Jimenez about his sales philosophy. Ray says sales is constantly driven by customer service. If you want to have long-term success in sales, you better take great care of the customer. Listen more here. Be Authentic: and Know Your Audience: It was hard to pick one lesson from this special episode with Bill Petrie and Dana Zezzo. As I have said before, this was like a Master’s class on sales and social. But Dana and Bill remind us to be authentic, but to know our audience in order to be super efficient in sales. Watch the full show here! Own Your Media: One of my favorite new episodes included Joe Pulizzi. He is the King of Content Marketing and he reminds us that we need to have a process in place to actually get our leads to give us their information. If we have Facebook friends, Facebook owns them. Joe goes into more in the full episode here! Make an Impact and Grow: Danny Rosin and I talk about the way to grow your business is in the “right way” here. Danny tells us that he envisions Philanthropy will become the new “marketing done right.” Through making an impact, we can grow our business too. Learn more here. Listen to Your Customers To Drive Business: On this episode of Delivering Marketing Joy I talked with author and entrepreneur Tim Fargo. He told us how his newest venture TweetJukebox took off because he had an idea, then listened to his customers tell him how to change it! Here is the full episode. And these are just 5 great lessons from 6 great leaders. Please subscribe here if you never want to miss an episode. Or you can join our VIP list here so you get into the inner content circle! Let’s grow together!